I can't believe we're only a week away from Christmas and this is my first December blog post! This year the usual baking, pickling and cooking that usually comes with the month of December in my kitchen has not happenend. That might be partly due to having been away in New York for a week at the beginning of the month and also the fact that I am already back home at my mum and dad's house in Germany for my annual Christmas break. It's been freezing cold here the last couple of days. We've seen temperatures of -13C and plenty of snow, which has really helped to get me in a more christmassy mood, which up until now I've been lacking. I've also been out to buy the turkey and all the trimmings for a proper Christmas dinner next week. Yes, I'm spending Christmas in Germany, but there'll be a proper English Christmas dinner at this house nevertheless, and I'm sure there'll be a few recipes to share over the next few weeks because of it. For now I'll leave you with a recipe of Baked Apples, which my mum and I tried today, after she spotted it in a amagazine last night. It was the perfect treat to have whilst watching the snow being blown about outside! Soak your raisins in some rum, calvados or cointreau. Wash and decore your apples. Cut a slice of the top of the apple and carefully remove most of the flesh, until you are left with a shell that's roughly half an inch thick (1.5cm). Finely chop the flesh you have removed and place in a small bowl, together with the marzipan, nuts and raisins. Mix well and then divide and stuff the apples with the mix. Place the stuffed apples on a baking tray and bake in the oven for half an hour, until soft. 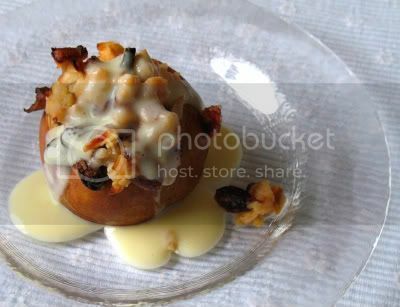 I've never had baked apples like this, looks gorgeous! Ooooh - those sound wonderful! Merry Christmas, Sylvie! yum, yum! jetzt weiss ich, was mir diese weihnachten abgegangen ist! die werde ich gleich mal machen! What a wonderful addition to a classic pudding! Yummm-mmmy!